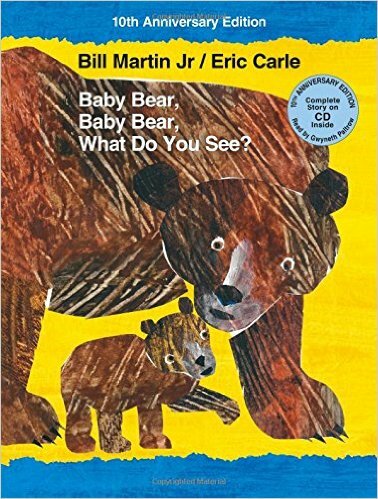 Adding to the collection of Bill Martin Jr. and Eric Carle’s classic Brown Bear series, Baby Bear, Baby Bear, What Do You See? explores the various animals and sights that Baby Bear sees. First there is a Red Fox, then a Flying Squirrel, then a Mountain Goat, and even a Blue Heron! Finally Mama Bear spots her little Baby Bear looking right at her. With the 10th Anniversary Edition, children can listen and read along as Gwyneth Paltrow interprets this fun story. Once again Bill Martin Jr. captures the rhythmic flow of his text as the story travels from one animal to another. Eric Carle transfers Martin Jr.’s story into his unique artistic style, filled with even more intricate layers. This story introduces different animals that children may not be as familiar with such as a blue heron, prairie dog, and mule deer. Animal lovers and fans of Martin Jr. and Carle’s other books will love this addition to the Brown Bear series.